The names for God are as endless as His power, His love, and His grace. Kind of by accident earlier this week (though I’m starting to believe not an accident at all!) I stumbled upon the idea of focusing on the various names of God during my personal devotion time. I had kind of “ended” what I had been studying a few weeks ago and was kind of just fishing around for something to focus on next … reading a little of this book here or that one there, turning to my default Psalms when all else failed. For a while there wasn’t much studying of scripture going on in my personal life at all. And I missed it. I knew I always enjoyed it when I was in God’s Word. I knew I needed it but between moving out if the apartment and into a house, a trip to CO, and other life chaos it slowly drifted out of the picture. Like I said, I missed it. Suddenly, it was right there in front of me. God as provider. God as protector. God as comforter. God as hope. God as joy-giver. God as life-sustainer. God as Savior. God as all we need and exactly what we need. So, I’m excited to dig a little more to who God is … in general and specifically in my life. Each day I’ve been picking one name to focus on along with at least one scripture that address Him as such. My “study” time each morning has been simple but oh so sweet! 1. Look up other Bible passages that address God in that way and think about what was going on in those various stories and why it might have been comforting or helpful for God to be addressed that way for the people involved. 2. 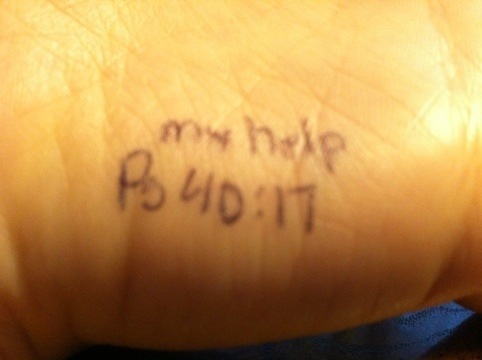 Write the name of God and scripture reference on my hand to remember throughout the day. I can’t wait to see how much I can learn about God this month by studying in this new way. I’m already just overwhelmed by the truth that God really is exactly what we need exactly when we need it.